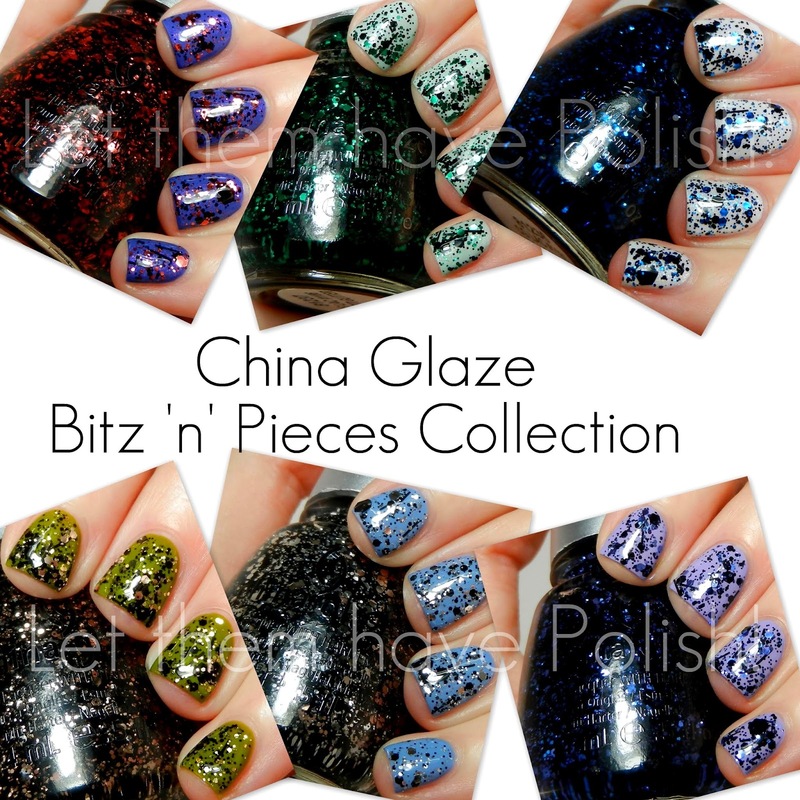 Today I am sharing my swatchies of the new China Glaze Bitz 'n' Pieces collection. I'm pretty happy to see all these mainstream companies jumping on the "quirky, chunky glitter" bandwagon. This collection is made up of Six glittery toppers which are heavily accented by Black "bits and pieces". I know many of us have been spoiled by the indie polish makers but these really are fun, cute and HEAVILY packed with sparkly goodness. To see swatches of these babies just continue reading ♥. All of these swatches are shown with a top coat of Seche Vite. These glitters don't dry gritty, but they do dry a bit dull. A good top coat will bring out shine and smooth the surface out completely. Bling it On is a mix of "Burple" Hexes in varying sizes, and Black hexes and Bars in varying sizes suspended in a clear base. This glitter has a nice spread and there is no fishing required. I used one "coat" of Bling it On over my base color. Scattered and Tattered is a clear-based blend of Rusty Red hexes in varying sizes, and Black Hexes and Bars in varying sizes. My bottle of Scattered and Tattered was a little thick, which made application a bit tricky. I might need to add a bit of thinner to my bottle. I used one coat of SaT for my swatch. Lemme just get this out of my system.. I LOVE THIS COMBINATION!!! Razzle me, Dazzle is a clear-based mix of light, Warm Gold hexes in varying sizes, and Black hexes and bars in varying sizes. I also ran into a thick bottle with this glitter. If you do as well, please, for the love of all that is good and great DO NOT PUT ACETONE IN YOUR POLISH. That will just ruin your pretty polishes. Invest in some polish thinner. Graffiti Glitter is a clear-based mix of Emerald Green hexes in varying sizes, and Black bars and hexes in varying sizes. My bottle of GG has a great consistency and great spread of glitter. I really love the edgy look of the Green and Black mix. Mosaic Madness is a clear-based mix of Sapphire Blue hexes in varying sizes, and Black bars and hexes in varying sizes. My bottle of MM has a great consistency and the glitter spread was great. Glitz 'n Pieces is a clear based Silver and Black blend. This is the most "normal" of the toppers. Glitz 'n' Pieces is a great addition to the collection of any "glitter- sammi" lover as the combination of glitters allows for endless sammi combos. That will do it for me today. Have you picked any of the Bitz 'n Pieces glitters yet? I can't really pick but I really loved Scattered and Tattered, Grafitti Glitter and Bling it On. Which are your faves? LOOOVE razzle me dazzle and glitz n pieces! I got Scattered and Tattered the other day. Huh! I had no idea these were made up of colored and black glitters. Seeing them in person at the store I wasn't too interested because I thought they were black jellies with colored glitter! But now you've sparked my interest! i'll probably get the black and silver one just because I'm kinda boring, but I also like the blue one! Thank you for taking your time to comment! I read each and every single one!! LTHP FAQ's: Which top coats do I use?